During 2017 a concept design was developed for the NRAH grounds by Anna and Cassia Read of Emerging Landscapes. This welcoming and beautiful garden will ease a transition into the Arts Hub and offer spaces for community celebration and quiet reflection. The design and plant selection honour the layers of history and link the garden to the Loddon River and the historic township of Newstead. 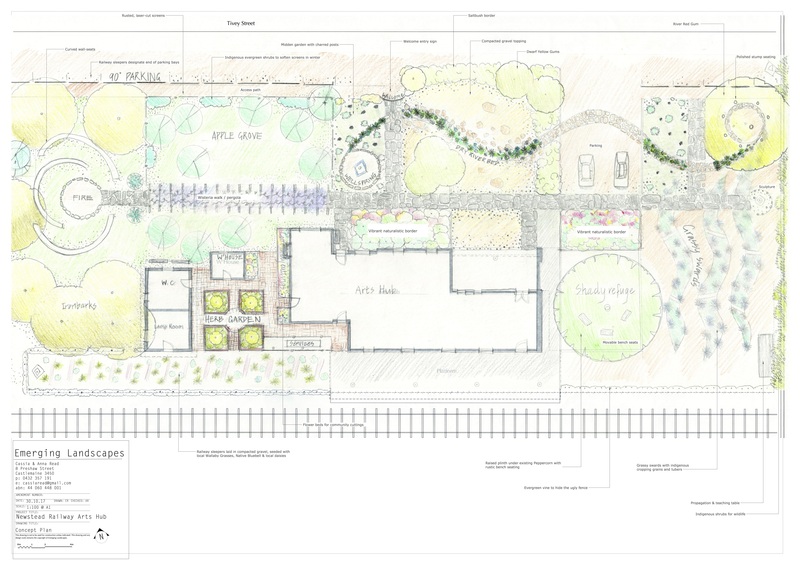 Providing refuge and feeding the senses, the garden will nurture artists and the arts. Ever-evolving, wildlife friendly and resilient, it will be a joy for all. The overall design has four distinct zones, lending itself to staging of construction as funding becomes available. These broad zones are: 1) Welcome entry and transition to an arts space; 2) Grassy swards and indigenous crops; 3) Community celebration and shady refuge; and 4) Fire circle and Ironbark stand. Click here to download the concept outline.